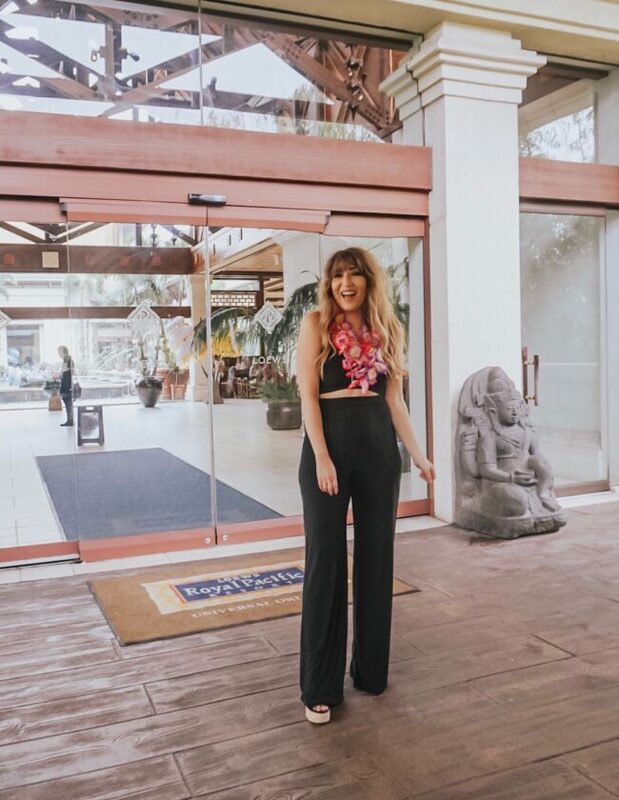 One month into the new year and I have to wonder– how are we all doing with our 2018 goals? Focusing on wellness is considered to be one of the most cliche of New Year’s resolutions, but for good reason… we all know we should be doing it and we all want to be healthy. I’ll be the first to confess– I’ve been awful at sticking to my routine this year! Because of that, with the start of a new month, I’m re-upping my commitment to getting myself and my skin back on track. I’m “Glowing Up”, if you will. I am horrible at this, especially when I’m busy or running around. I had an episode with dehydration a few years ago and it was not good. It was Thanksgiving and I felt so sick, I’ve never felt that awful in my life. Now, I can feel when I start to get dehydrated and when that happens… I’ll chug a ton of water. 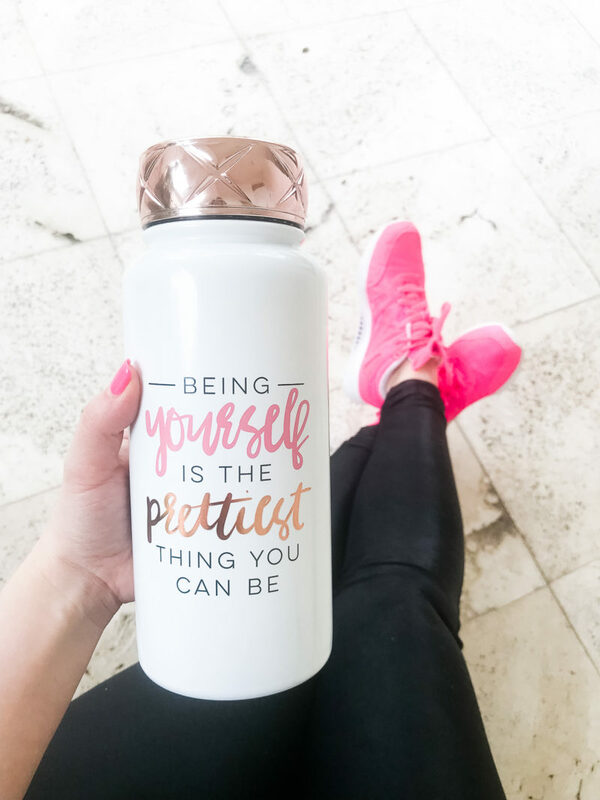 But it happens way more often than it should, and really, I need to be drinking plenty of water to help my body be in the best shape it can be, not just enough water to not die. (lol) In order to get this done, I got a giant water bottle and am committed to carrying it with me all the time. When I’m at my desk, I’m making sure to take frequent trips to refill. Being properly hydrated is key to so many things, including having great skin. Often times when I read celeb interviews and they’re asked about their skin… they all say they drink tons of water. Message received. Go to bed early, get a good night’s sleep. I am a total night owl. I love staying up late, and do it pretty much every night. I don’t usually go to bed before 1am, which is an epic fail. I’ve been saying for years that I want to train myself to go to bed early, and sometimes I’ll do it for a week or so, but inevitably, I’m like “oh yeah, one more episode of that show I’m bingeing” and there goes that. On days that I go to bed early and am up early… I feel 1000% more productive. More than just productivity, getting a good night’s sleep is key for so many other things. Keeping your immune system up, having great skin, losing weight… all things that are actually important to me! Making over my sleep schedule will most likely benefit my skin and body in a huge way. 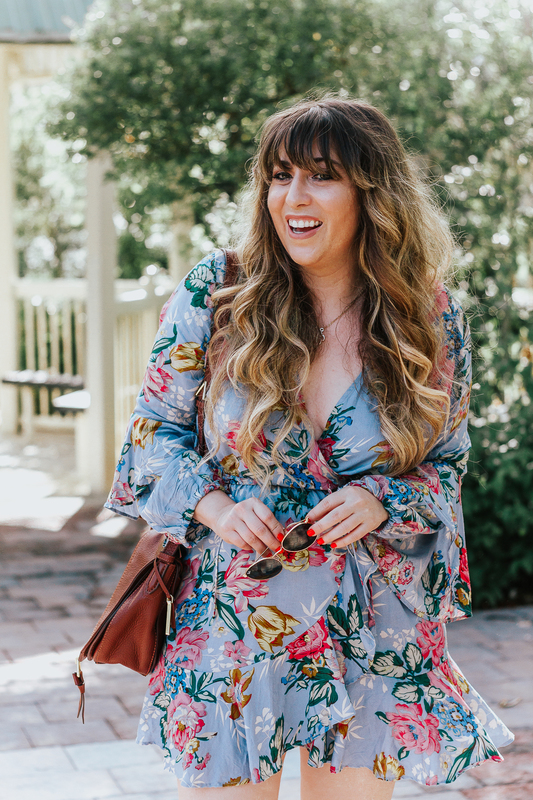 Focus on full-body skincare, not just my face! I’ve been pretty good about my face over the last few years, and have implemented a really good anti-aging regimen. I’ve recently realized that I don’t think much about the rest of my body… where I have the most skin, obviously. 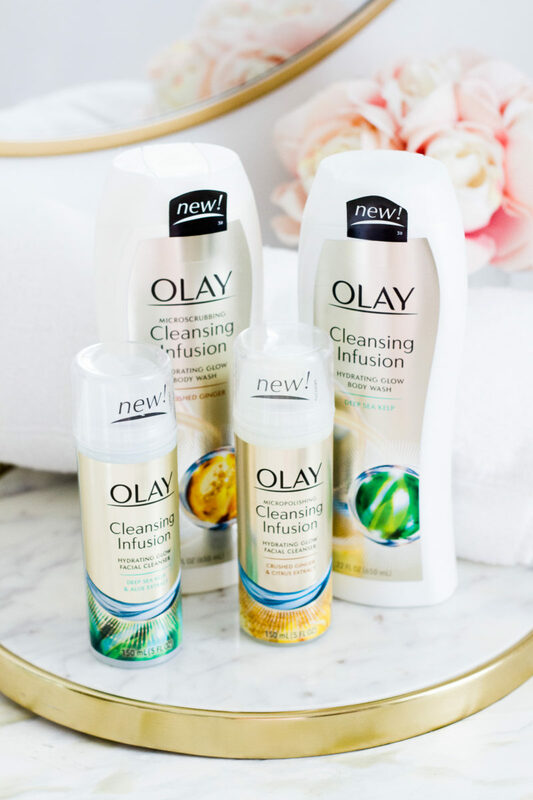 One way I’m prioritizing full body skincare is by integrating Olay Cleansing Infusions, Olay’s newest cleansing solution for both face and body into my daily skincare routines. I have a full on obsession with glow-y skin, (which you all are well aware of!) so I am psyched to start using this product line. There are two facial cleansers: the Olay Micropolishing Cleansing Infusion Hydrating Glow Facial Cleanser with Crushed Ginger and Citrus Extract (for exfoliating!) and Olay Cleansing Infusion Hydrating Glow Facial Cleanser with Deep Sea Kelp and Aloe Extract. I’ll be alternating the two. For body, there are the Olay Microscrubbing Cleansing Infusion Hydrating Glow Body Wash with Crushed Ginger (for exfoliating!) 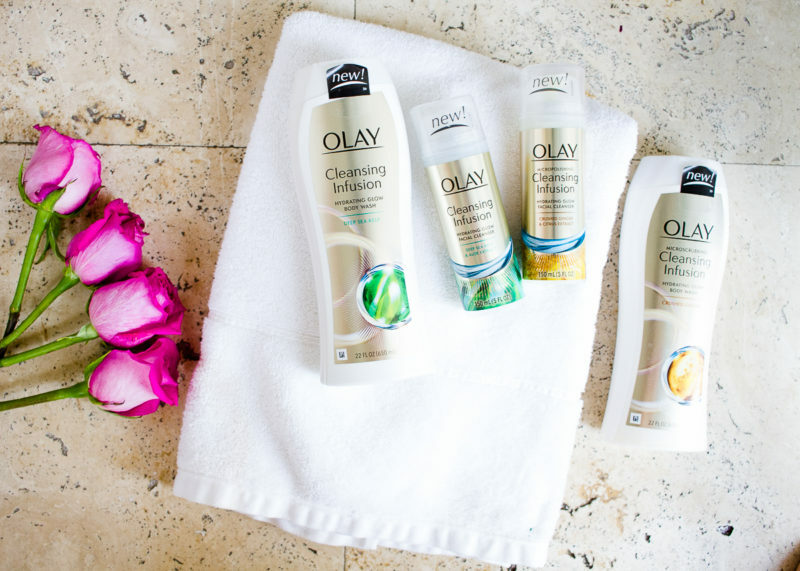 and the Olay Cleansing Infusion Hydrating Glow Body Wash with Deep Sea Kelp. These cleansers are gentle and non-stripping and are proven to enhance skin’s radiance after just one use. So far, I’ve really enjoyed using the products. The Micropolishing and Microscrubbing are gentle, but effective and I feel like my skin looked better after the first time using the products. I’m interested to see how much my skin improves over the next few weeks with continuous use! I think it’s really important for your skincare routine to constantly be evolving. We should always be addressing skincare concerns as they pop up and as our skin changes over time. Maybe that’s shifting your focus from acne to aging or figuring out the perfect combination of fighting both. (like me!) But whatever your skincare concern, glow-y, healthy skin is one that we all want at any age. 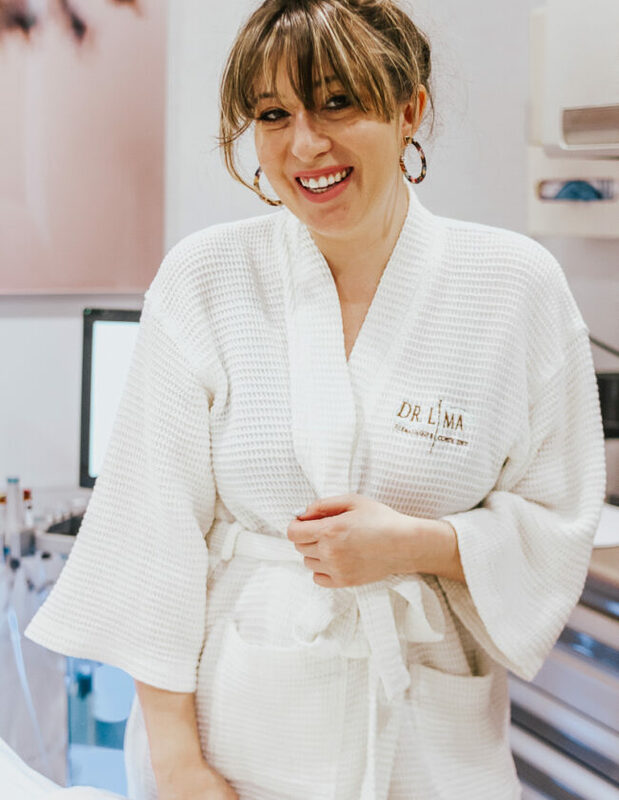 I’d love to know– what are your main skincare concerns? How has your skincare routine helped you “glow up” over time? Head to the comments section and let me know!